There are many ways to describe Distress Centre Calgary counsellor, Edwin Morales. Most people would describe Edwin as compassionate, enthusiastic, and driven. However, if you ask him, there is one unique word that can summarize him entirely: Perspective. Although, this word is not common to describe someone in their entirety, the word couldn’t be more perfect to describe Edwin. Edwin, who is originally from Guatemala, grew up in a traditional family home: “In Guatemala it is common for families to have a shared courtyard,” explained Edwin. “My relatives would live around the courtyard. For us, we even had relatives across the street, so I saw my grandparents, cousins, aunts, and uncles nearly every day.” To say family is a big part of Edwin’s life is an understatement, as family in Guatemala is of the utmost importance. As a child, Edwin enjoyed traditional sports like soccer and baseball, as well as hanging out with other children in his neighbourhood after school. Although life was going well for Edwin and his family, there came a time for a change. “Guatemala, the place, is paradise with beautiful vegetation, volcanoes, and beaches. But in Guatemala, it is also possible to face financial issues, political issues, or safety issues. Overall, the move, for us, was for a better future,” says Edwin. So Edwin – who was now a young teenager– ventured to Calgary, Alberta, Canada with his family. When Edwin and his family arrived in Calgary they immediately began to settle in. “One of the first things I noticed when we arrived was the snow,” says Edwin. “I had never seen it before and I remember thinking to myself ‘wow, I can’t wait to touch it!’’’ The second thing Edwin noticed was that French was another official language. “When I realized that there were two languages I figured why not learn both?” laughed Edwin. By the time Edwin graduated high school he was fluent in his mother tongue (Spanish), English, and was well on his way to becoming fluent in French. After high school, Edwin knew he wanted a career where he could help people, so he pursued post-secondary education at the University of Calgary where he graduated with a degree in psychology. Two-years later, Edwin took an introductory course in social work and fell in love with the field. This led Edwin to complete his bachelor’s degree in social work. In his new role, he supervised the volunteers on the crisis lines, and provided them with feedback and his social work expertise. “I worked as a CCC and 211 Information Specialist for three years, and during that time I began to have a change of perspective,” says Edwin. “One of the main things I learned when I was working in the contact centre is just how amazing the volunteers are. The volunteers are willing to give of themselves. They give their time, their gas money, and their compassion to help others. So I can honestly say during those three years I felt very inspired,” says Edwin. 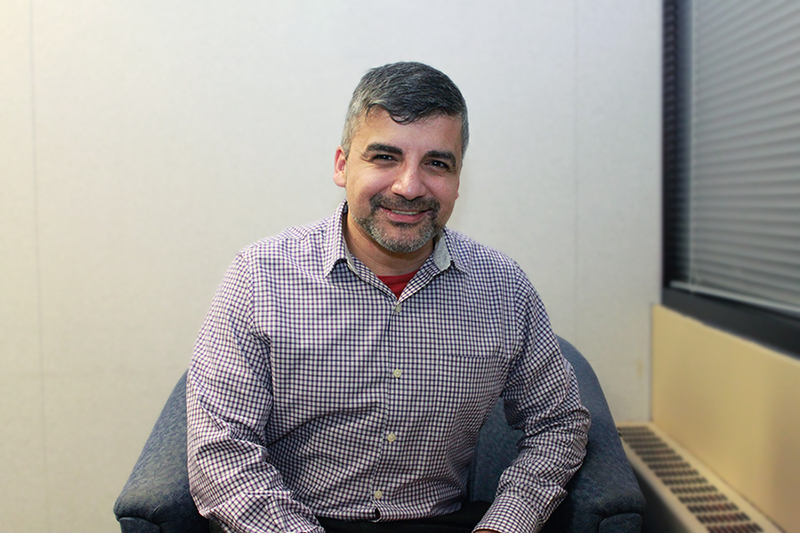 “In addition I also learned that a crisis can be literally anything… like anything!” Edwin’s change in perspective enhanced his passion for social work. During this time Edwin had also been working towards obtaining his master’s degree in Clinical Social Work.